This PDF 1.5 document has been generated by Acrobat PDFMaker 7.0.7 for Word / Acrobat Distiller 7.0.5 (Windows), and has been sent on pdf-archive.com on 27/04/2011 at 19:38, from IP address 129.82.x.x. The current document download page has been viewed 1128 times. File size: 183 KB (8 pages). number of volunteers, there will not be enough supervision, materials or work. Additional volunteers will be sent home. 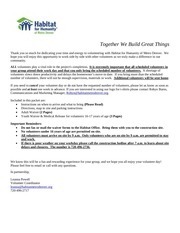 Communications and Marketing Manager, Robyn@habitatmetrodenver.org. 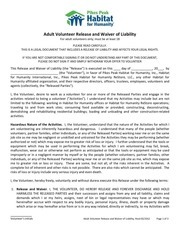 • Do not fax or mail the waiver forms to the Habitat Office. Bring them with you to the construction site. • No volunteers under 16 years of age are permitted on site. delays and closures. The number is 720-496-2736. We know this will be a fun and rewarding experience for your group, and we hope you all enjoy your volunteer day! How can I volunteer to work at a site? volunteer will be permitted to stay and work. by calling the Construction Hotline. volunteers commit to working a full day until 4:30.
orientation you will be asked to leave. What happens at a Habitat construction site? supervisors will teach you what you need to do. The most important item to wear is sturdy shoes. Call the Construction Hotline at 720-496-2736.
accomplish what we can or may have to close the site. What if I can’t make it after all? not bring your own power tools. one under the age of 16 is allowed on site. 16-17 yr.
must have a parental waiver and medical release signed. are not permitted on our construction sites. 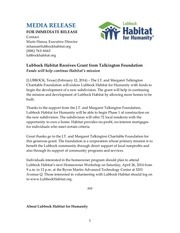 Are there other ways to help Habitat? Please see rtd-denver.com to plan your trip. All volunteers are asked to arrive at the site a few minutes before 9:00 am and commit to working the full day until 4:30 pm. safety glasses will be provided for your use on your workday. Volunteers under 16 years of age are not permitted. in any place that is performed by the Volunteer on behalf of Habitat. hereafter arise on account of any first aid, treatment or service rendered by any person in connection with Volunteer Services. deemed employees or agents of Habitat and Habitat shall not be responsible for the purchase of worker's compensation insurance. 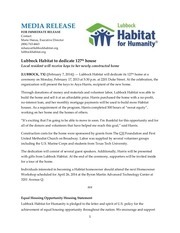 HABITAT TO PROVIDE INSURANCE COVERAGE OF ANY KIND TO THE VOLUNTEER. provisions of this Release which shall continue to be enforceable. performed on or about Habitat construction, Outlet store, or office work sites. 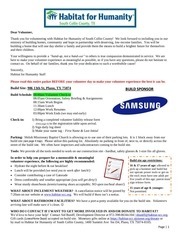 Only persons 16 years of age or older are permitted at the construction, Outlet store, office work sites. Only persons 18 years of age or older are permitted to use power tools, or work above ground level. Hard hats and safety glasses must be worn at all times on construction sites. Wear sturdy footwear – no open-toed shoes permitted. No alcohol or illegal drugs. Never enter a ditch or hole without approval from a construction supervisor. 1. Pull or bend over all nails from boards, doorframes and scrap pieces of wood. 2. Keep work area clean and safe. 3. If you see an unsafe act or condition, report it to a supervisor or correct it if safe to do so. 4. Return tools to Tool Trailer (or Tool Desk at Outlet); put nails and tools in proper containers. 5. Don’t lift beyond your strength; get a partner to help. Remember to bend your knees and lift with your back straight. 6. Keep an eye on your load as you move and turn so as not to hit someone. 7. Walk; do not run, when carrying tools or materials. 8. Report any damaged tools or power cords to a supervisor for repair. 9. Tell the supervisor immediately in the event of an injury. 10. First aid kits, fire extinguishers, maps to the nearest hospitals and MSDS notebooks are located on-site. 12. Think and concentrate on your work task. 1. Always wear back braces when lifting objects. 2. When moving a refrigerator, have at least two people (one to guide the dolly, a second to help stabilize the appliance). 3. Volunteers are never allowed to operate the forklift, unless they are forklift certified. 4. Never climb on top of unstable stacked items. have the possibility of falling over. 6. Keep aisles clear of debris. 7. Clean up all spills as soon as you become aware of them—concrete can be slippery when wet. 8. Clean up broken glass immediately. Be careful and do not use your bare hands. 9. Never let a customer climb up on the shelves, pallet racks, or ladders. 1. Keep your work area clean and orderly. Clean up and put equipment away when finished. 2. Be alert for, and heed all, warning signs and tags. 3. Make sure all fire exits and fire doors are kept clear. 4. Follow safe lifting practices. deemed employees or agents of Habitat, and Habitat shall not be responsible for the purchase of worker's compensation insurance. 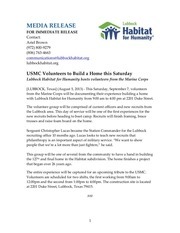 Volunteer Services performed on or about Habitat construction, Outlet store, or office work sites. 10. Only persons 16 years of age or older are permitted at construction, office, and Outlet store work sites. 11. Only persons 18 years of age or older are permitted to use power tools, or work above ground level. 13. Hard hats and safety glasses must be worn at all times on construction sites. 14. Wear sturdy footwear – no open-toed shoes permitted. 17. No alcohol or illegal drugs. 18. Never enter a ditch or hole without approval from a construction supervisor. 13. Pull or bend over all nails from boards, doorframes and scrap pieces of wood. 14. Keep work area clean and safe. 15. If you see an unsafe act or condition, report it to a supervisor or correct it if safe to do so. 16. Return tools to Tool Trailer (or Tool Desk at Outlet); put nails and tools in proper containers. 17. Don’t lift beyond your strength; get a partner to help. Remember to bend your knees and lift with your back straight. 18. Keep an eye on your load as you move and turn so as not to hit someone. 19. Walk; do not run, when carrying tools or materials. 20. Report any damaged tools or power cords to a supervisor for repair. 21. Tell the supervisor immediately in the event of an injury. 22. First aid kits, fire extinguishers, maps to the nearest hospitals and MSDS notebooks are located on-site. 24. Think and concentrate on your work task. 10. Always wear back braces when lifting objects. 11. When moving a refrigerator, have at least two people (one to guide the dolly, a second to help stabilize the appliance). 12. Volunteers are never allowed to operate the forklift, unless they are forklift certified. 13. Never climb on top of unstable stacked items. 15. Keep aisles clear of debris. 16. Clean up all spills as soon as you become aware of them—concrete can be slippery when wet. 17. Clean up broken glass immediately. Be careful and do not use your bare hands. 18. Never let a customer climb up on the shelves, pallet racks, or ladders. 5. Keep your work area clean and orderly. Clean up and put equipment away when finished. 6. Be alert for, and heed all, warning signs and tags..
7. Make sure all fire exits and fire doors are kept clear. 8. Follow safe lifting practices. PLEASE READ CAREFULLY! THIS IS A LEGAL DOCUMENT, WHICH AFFECTS YOUR LEGAL RIGHTS! governed by and interpreted in accordance with the law of the State of Colorado. This file has been shared by a user of PDF Archive. Document ID: 00030314.